This is my 1st attempt at cornbread. I really like it. I made it on my own terms. I used more egg than the suggested number because I really like moist cornbread. I also only used ingredients I had on hand because I did not want to have to go to the grocery store. I made the cornbread from corn that is biodynamic from the Barefoot Farmer farm, and it was hand ground just last week. The eggs I used are from a small farm in Hohenwald, TN which employs organic and free range practices. The fat I used is bacon fat I have kept to make corny foods like fried corn, popcorn and cornbread. I have not churned my own butter lately, so I do not have butter milk on hand, so I used what I had on hand which was soy milk and yogurt. In general, I don't eat a lot of cornbread because I find most recipes are dry and crumbly. Trying to put butter on crumble is a futile effort which I really dislike. I like moist cornbread which I can pick up with my fingers and not have it crumble to the floor. I like moist cornbread because it does not "need" more butter to moisten it up, but of course one can add more butter because it tastes good. 1. I really like moist cornbread, so I used 4 eggs instead of 3. 2. I did not butter milk, so I used 1 cup soy milk and 1 cup yogurt. This liquid can be butter milk, all yogurt, cream, whole milk, almond milk, coconut milk, soy milk, etc. I only had soy milk and yogurt in the house, and I like the very slight tartness the yogurt brings to the overall flavor. I can't tell that there is yogurt in the cornbread, rather the sourness from the yogurt is perceived by the sour receptors of the tongue, which activates more portions of the tongue to really get the full flavor of the corn bread. 3. I added spices including garlic, cayenne and ground black pepper. In the wet ingredients, I can see where one might want to add cheese, jalapenos, herbs, or other flavors one might want in corn bread. 4. For my fat ingredients, I used 1/4 cup of butter and 1/4 cup of bacon fat I have saved from recent bacon I cooked up. I just have not had time to make butter of late, so I don't have much butter in the house, so I had to bolster the little butter I had with the bacon fat. Other fats can be used, and in greater quantity if you want more moisture. I think that the fat used must be able to stand up to 400F, so peanut oil may be used. Butter and bacon (pork ) fat seems to be the best way to make this corn bread. 5. For a sweet cornbread, honey, sorghum, maple, or sugar can be added. I am also thinking that this can be made into a sweet pastry cake if enough sweetness is added, and 4 eggs are used. 6. This can be a gluten-free and dairy free cornbread cake if non-dairy liquid like coconut milk is used, and a non-dairy fat is used like peanut oil or pork fat. 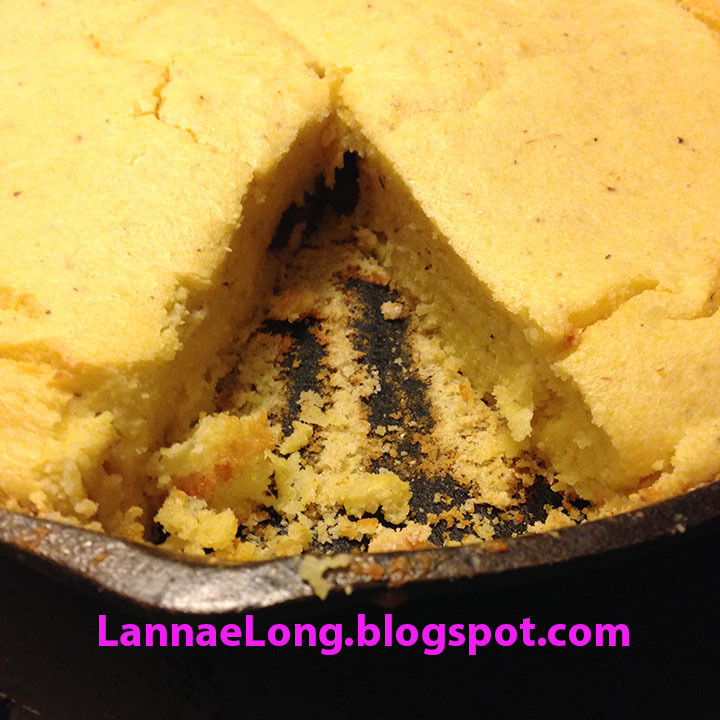 I am so glad to make this cornbread. It opens up a whole new world for me and corny goodness! For me, there are those dishes in my life that I keep thinking about, and have made it to the top 10 in my life. One top 10 dish I had about 40 years ago. The dish was an artichoke with a lemon vinaigrette that was placed in the center of the artichoke. The restaurant, with a name which escapes me right now, was somewhere on Wilshire Blvd between Brentwood, CA and Beverly Hills, CA. The restaurant was a little lunch place where ladies-who-lunch, and where moms had "mom dates with kids". My family re-created this dish a number of times over the years. I have re-created this dish, not as often as I like, but I still think about this dish, and when artichoke season is up and running, I will make it for myself this year. There was another dish, in Lesmont, France, that I still think about too. The dish was a simple fresh salad with smoked chicken gizzards and a warm herb dressing, probably made from the fat the gizzards were cooked in. The gizzards had a duel texture of a little crispy on the outside, and tender on the inside. I have tried recreate this dish, but I ruin the gizzards, or the gizzards are just like chewing on erasers. There is a recent dish that made my Top 10, and it is deceptively simple. I am sure when I try to re-create it at home, it is not going to be as good. The dish sounds incredibly simple. 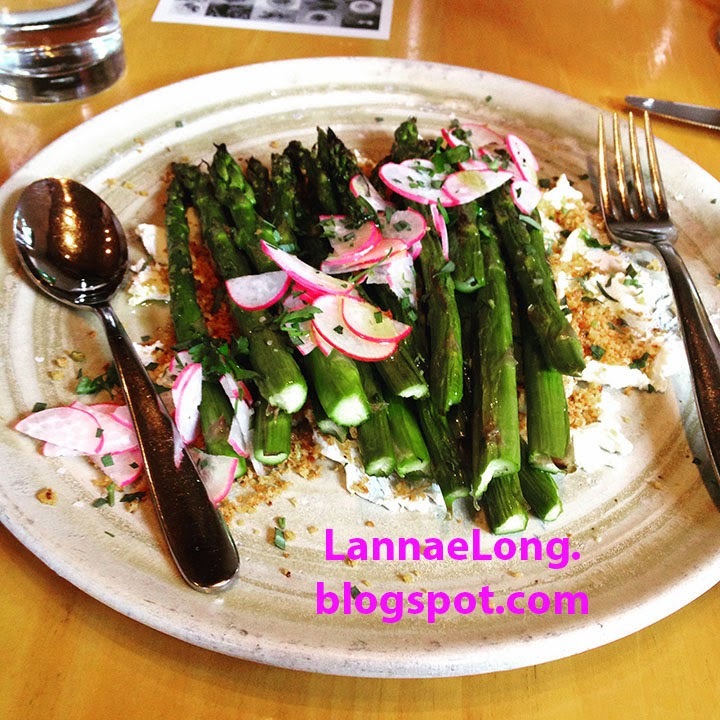 The dish is grilled asparagus on top of chevre, and topped with with sliced radish, mint, and bread crumbs. This dish has the perfect texture combination of smooth from the chevre, toothy from the asparagus and the crunch from the radish and bread crumbs. The dish has the perfect flavor of creamy from the chevre, acid brightness from lemon, pungent bite from the radish, and the salty/peppery-ness from the salt, pepper and good olive oil. The version of this dish I tasted was so good, that I literally licked the plate. This dish tasted good because the base ingredients were really good. I am guessing the chevre was from one of the local goat cheese farms near Nashville, the asparagus and radishes were form a local farm, and the bread crumbs are made by Tandy Wilson, and his bread crumbs are so friggin' good, and possibly the best bread crumbs you can get! I cannot duplicate the bread crumbs. I can guess where the radishes are from, and I can get excellent radishes from the Barefoot Farmer. I do have some single source, organic, California grown, olive oil I can use. I think the bread crumbs are going to be the ingredient I will have to research, to be able to get the crunchy, toasty and nuttiness that you get with a Tandy Wilson bread crumb. A few weeks ago, Tandy Wilson, Chef and Owner of City House, and multiple year James Beard nominated Chef, invited Steven Satterfield, Chef and Co-Owner of Miller Union Atlanta, and also a James Beard nominated Chef, to cook a special multi-course dinner to celebrate Satterfield's new book Root to Leaf (2015). This asparagus dish is on page 10 of the cook book. This is a break through cook book for me. I am an omnivore, and sometimes I struggle with getting enough fruits and veggies into my diet. 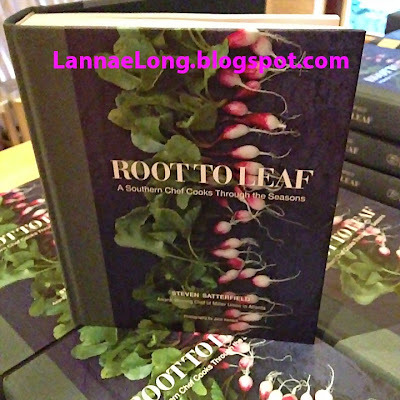 Root to Leaf is cook book that puts veggies and fruits as central elements to the dishes, rather than meat. There are recipes which include meat, and there are also vegetarian, vegan dishes as well. The recipes are organized by season, so it is easy to look to see what is fresh and good to eat now. This is quite helpful now that the Nashville Farmer's Market is a producers only market, and is only selling what is seasonally harvested. I am looking forward to winter when I have a house load of kale, root veggies and butternut squash as my veggie base. I can only make so much butternut squash soup and sauteed kale. The Root to Leaf cook book is really great for me because I have been a bit turned-off by vegetarian and vegan dishes of my past. I came to learn about vegan and vegetarian foods in the 1990s, in Western MA where I was taught that the main-stay vegan dish was beans and rice with bee pollen sprinkle. I did not eat a lot of meat back then because I could not afford it, and college cafeteria had the worst, bottom quality Ar@m@rk meat. The burgers had hard chunks in them like bone chips, the "veal" pucks were more breading and soy than veal (and corporate veal is a complete no-go for ethical treatment of livestock), and the chicken patties were more deep fried breading and chicken by-products than chicken. All the veggies on the hot-line were canned. Canned peas, corn, carrots, and potatoes were on every menu. The canned peas and carrots were so slimy mushy and yucky, that I cannot eat canned carrots or peas even now. That cafeteria food made me sluggish and it made me not want to eat meat. There was an alternative to cafeteria food, and it was called "Earth Foods" at the student common. "Earth Foods" everyday has a bean and rice dish, everything was this brownish/grey color, and everything had a texture of a think gloppy paste. It didn't taste great, the texture was mushy terrible, but it also did not make me feel sick to my stomach like the crappy highly-processed yuck at the cafeteria. I said to myself, when I can afford better food, I was never going to eat vegan brownish/grey beans and rice pasty mush ever again. I am looking forward to diving into Root to Leaf and start a new relationship with veggie and fruit based dishes which taste good, have a good texture and are pleasant to look at. I need to change my mind and bring it to the present, and believe vegetarian and vegan food doesn't have to be brownish-grey mushy pasty beans and rice. Veggie foods can be tasty, crunchy, smooth, bright, and plate licking good.